I love stories behind homes. This particular story is about the Tulip Tree. When a Grandson was born, Grandma planted a Tulip tree seedling in the back yard behind the house. The Grandson is now 40-something and the seedling is a full grown Tulip Tree. The beauty of growth and change is that it is constant. These stories fuel my desire for human connection. 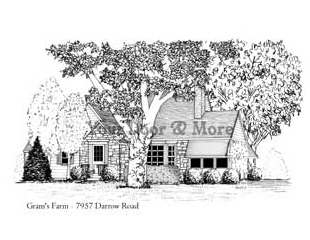 I not only illustrate the house, landscape and yard, I tell the human story. That is my favorite part!